I try not to be biased, but I had my doubts about hiring Stevie. His placement counsellor assured me that he would be a good, reliable busboy. But I had never had a mentally handicapped employee and wasn’t sure I wanted one. I wasn’t sure how my customers would react to Stevie. 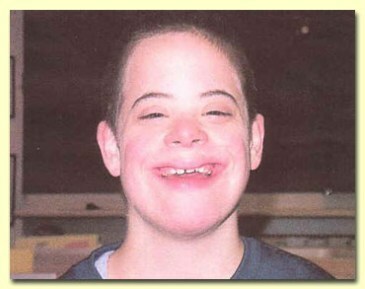 He was short, a little dumpy with the smooth facial features and thick-tongued speech of Downs Syndrome. I wasn’t worried about most of my trucker customers because truckers don’t generally care who buses tables as long as the meatloaf platter is good and the pies are homemade. The four-wheeler drivers were the ones who concerned me; the mouthy college kids travelling to school; the yuppie snobs who secretly polish their silverware with their napkins for fear of catching some dreaded “truck stop germ” the pairs of white-shirted business men on expense accounts who think every truck stop waitress wants to be flirted with. I knew those people would be uncomfortable around Stevie so I closely watched him for the first few weeks. I shouldn’t have worried. After the first week, Stevie had my staff wrapped around his stubby little finger, and within a month my truck regulars had adopted him as their official truck stop mascot. After that, I really didn’t care what the rest of the customers thought of him. He was like a 21-year-old in blue jeans and Nikes, eager to laugh and eager to please, but fierce in his attention to his duties. Every salt and pepper shaker was exactly in its place, not a bread crumb or coffee spill was visible when Stevie got done with the table. Our only problem was persuading him to wait to clean a table until after the customers were finished. He would hover in the background, shifting his weight from one foot to the other, scanning the dining room until a table was empty. Then he would scurry to the empty table and carefully bus dishes and glasses onto his cart and meticulously wipe the table up with a practiced flourish of his rag. Over time, we learned that he lived with his mother, a widow who was disabled after repeated surgeries for cancer. They lived on their Social Security benefits in public housing two miles from the truck stop. Their social worker, who stopped to check on him every so often, admitted they had fallen between the cracks. Money was tight, and what I paid him was probably the difference between them being able to live together and Stevie being sent to a group home. That’s why the restaurant was a gloomy place that morning last August, the first morning in three years that Stevie missed work. He was at the Mayo Clinic in Rochester getting a new valve or something put in his heart. His social worker said that people with Downs Syndrome often have heart problems at an early age so this wasn’t unexpected, and there was a good chance he would come through the surgery in good shape and be back at work in a few months. Frannie, the head waitress, let out a war hoop and did a little dance in the aisle when she heard the good news..
Belle Ringer, one of our regular trucker customers, stared at the sight of this 50-year-old grandmother of four doing a victory shimmy beside his table. Frannie blushed, smoothed her apron and shot Belle Ringer a withering look. He grinned. “OK, Frannie, what was that all about?” he asked. Frannie quickly told Belle Ringer and the other two drivers sitting at his booth about Stevie’s surgery, then sighed: “Yeah, I’m glad he is going to be OK,” she said. “But I don’t know how he and his Mom are going to handle all the bills. From what I hear, they’re barely getting by as it is.” Belle Ringer nodded thoughtfully, and Frannie hurried off to wait on the rest of her tables. Since I hadn’t had time to round up a busboy to replace Stevie and really didn’t want to replace him, the girls were busing their own tables that day until we decided what to do. She handed the napkin to me, and three $20 bills fell onto my desk when I opened it. On the outside, in big, bold letters, was printed “Something For Stevie”. His placement worker said he’s been counting the days until the doctor said he could work, and it didn’t matter at all that it was a holiday. He called 10 times in the past week, making sure we knew he was coming, fearful that we had forgotten him or that his job was in jeopardy. I arranged to have his mother bring him to work. I then met them in the parking lot and invited them both to celebrate his day back. Stevie was thinner and paler, but couldn’t stop grinning as he pushed through the doors and headed for the back room where his apron and busing cart were waiting. “Hold up there, Stevie, not so fast,” I said. I took him and his mother by their arms. “Work can wait for a minute. To celebrate you coming back, breakfast for you and your mother is on me!” I led them toward a large corner booth at the rear of the room. I could feel and hear the rest of the staff following behind as we marched through the dining room. Glancing over my shoulder, I saw booth after booth of grinning truckers empty and join the procession. We stopped in front of the big table. Its surface was covered with coffee cups, saucers and dinner plates, all sitting slightly crooked on dozens of folded paper napkins. “First thing you have to do, Stevie, is clean up this mess,” I said. I tried to sound stern. Stevie looked at me, and then at his mother, then pulled out one of the napkins. It had “Something for Stevie” printed on the outside. As he picked it up, two $10 bills fell onto the table. Stevie stared at the money, then at all the napkins peeking from beneath the tableware, each with his name printed or scrawled on it. I turned to his mother. “There’s more than $10,000 in cash and checks on that table, all from truckers and trucking companies that heard about your problems. “Happy Thanksgiving,”. Well, it got real noisy about that time, with everybody hollering and shouting, and there were a few tears, as well. But you know what’s funny? While everybody else was busy shaking hands and hugging each other, Stevie, with a big, big smile on his face, was busy clearing all the cups and dishes from the table. At this point, you can bury this inspirational message or forward it fulfilling the need! If you shed a tear, hug yourself, because you are a compassionate person.